Chicago, Ill. — Rosemont Baseball Group announced today that the new American Association of Independent Professional Baseball minor league team will be named the “Chicago Dogs.” The team’s home games will be played in the $60 million, 6,300-seat new stadium currently under construction in Rosemont at the intersection of Balmoral Avenue and Pearl Street, west of I-294. The Chicago Dogs are scheduled to begin play in May 2018 and ticket packages for their inaugural season are now available at www.thechicagodogs.com or by calling 312-374-8090. Follow the team on social media at @TheChicagoDogs on Facebook, Twitter, Instagram and Snapchat. 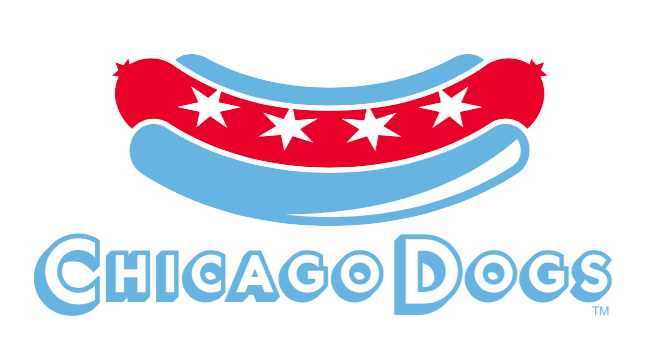 The Chicago Dogs’ logo features the colors and stars of the iconic Chicago flag and was inspired by baseball, hot dog and Chicago lovers alike. It represents the team’s brand of family fun and Chicago-style baseball. The logo was designed by Adrenalin Inc., a Denver-based full service brand expansion agency with a wide variety of clients in the sports industry including the LA Kings, Harlem Globetrotters and the United States Olympic Committee. Baseball team co-owners Shawn Hunter and Steven Gluckstern come to Rosemont with extensive backgrounds in professional sports. Hunter has more than 20 years of sports marketing experience, previously serving as President of Anschutz Entertainment Group Sports (AEG), where he oversaw eleven sports teams worldwide. Prior to his position with AEG, Hunter was President of the National Hockey League’s Phoenix Coyotes. Hunter also held the position of Executive Vice President of the NHL’s Colorado Avalanche and NBA’s Denver Nuggets. Gluckstern is a previous owner of the National Hockey League’s Phoenix Coyotes and New York Islanders. Gluckstern is currently founder, CEO and Chairman of Rio Grande Neurosciences Inc., a New Mexico-based medical technology firm that focuses on non-invasive therapeutics. One of the company’s current focuses involves pioneering the development of technologies utilized to aid in the treatment of concussions. Prior to founding Rio Grande Neurosciences Inc., Gluckstern had a 25-year career as an entrepreneur and funds manager, holding a variety of positions including General Manager of reinsurance operations of the Berkshire Hathaway Insurance Group under the direction of investor Warren Buffet.